New Jersey's best-known hotels are the seven remaining casino-hotels in Atlantic City. In 1976, New Jersey voters approved a constitutional amendment allowing casino gambling limited to Atlantic City; subsequent enabling legislation required that any casino approval would be linked to construction or renovation of a hotel with at least 550 guest rooms incorporating the casino. The first casino-hotel, Resorts Atlantic City, opened in 1978, and the City's growth in gaming revenue exceeded 50% through 1985. Expansion continued at a somewhat slower pace into the next century, accounting at its peak for over 40,000 jobs at twelve casino-hotels. Growth slowed, however, with competition from such neighboring states as Connecticut and later from Pennsylvania, which had been a major source of Atlantic City visitors. 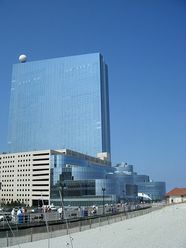 ​ The most recent surviving hotel, the Borgata Hotel Casino and Spa, opened in July 2003, with several of its competitors also undergoing expansion and renovation projects, along with separate proposals for new casino-hotels, including what was promoted as the City's most expensive project, the $2 billion Revel casino-hotel. In the next few years, however, the Atlantic City casino-hotel industry was forced to cope with the sharp drop in visitors, largely due to competition from casinos in other states and the economic recession which took hold in 2008. Since 2006, total casino revenues in Atlantic City have fallen by over 50%. In 2014, saddled with declining gambling revenue and high debt burdens, four of the then twelve casino-hotels closed, including the new Revel Casino, which opened in 2012, but declared bankruptcy two separate times before closing in September 2014. In October 2016, the Trump Taj Mahal closed after a prolonged strike by its employees. Atlantic City's municipal government also was placed under state management in November 2016 pursuant to legislation authorizing a takeover to restructure its operations and finances. In March 2017, a proposed sale of the Atlantic Club which closed in January 2014 (opened originally in 1980 as the Golden Nugget operated by Steve Wynn) was announced, with the hotel to be converted to a 300-room non-casino hotel including a large indoor water park. In the 2016 calendar year, total casino revenue in New Jersey was $2.56 billion, a 1.5% gain from 2015, largely due to online gaming, which began in 2013, offsetting a continuing decline of revenues from casinos within the hotels. For 2016, the leading casinos in revenue were Borgata ($722 million); Harrah's ($358 million); and Caesars ($302 million). The total non-gaming revenue of the casino-hotels from rooms, food and beverage, entertainment and other products and services was $1.1 billion. Apart from Atlantic City, New Jersey features a broad variety of lodging choices. Hotels in larger cities focus on business travelers; the Jersey Shore continues to have a diverse mix of motels, inns and bed and breakfasts; and other areas rely on local establishments for hosting visitors. The Hudson waterfront also has become a site for new hotels competing with more expensive competitors in New York City. Like the nation, New Jersey also has seen a surge in users of online sites (such as Airbandb, Tripping.com and HomeAway.com) for booking private dwellings for stays, a development which has added competition to more traditional lodgings and provoked controversy over their status under state law and local ordinances. In addition to traditional lodging, New Jersey also has seen a surge in peer-to-peer offerings over the Internet by individuals of stays in homes, apartments and other residences. The largest Web service is AirBnB.com, which in January 2016 posted just under 3,500 listings in New Jersey, with Jersey City the leading location with over 900 listings. Major competitors to AirBnB include HomeAway.com, 9Flats.com, FlipKey.com and VacationRentals.com. The booking services vary in their business models, with some charging an annual fee for listings and others providing free listings but receiving a percentage of the rental amount if the property is leased. The growth of these services has been somewhat controversial, with traditional hotel and lodging firms objecting to what they see as unfair competition due to the exemption of individual peer-to-peer listings from regulatory requirements with which commercial lodging firms are required to comply in such areas as licensing, taxes, building safety and insurance. As indicated above, many North Jersey hotels and other lodging options, particularly along the Hudson waterfront, also have become popular stays for business and pleasure visitors to New York City, offering easy access as well as more affordable rates than their New York competitors.